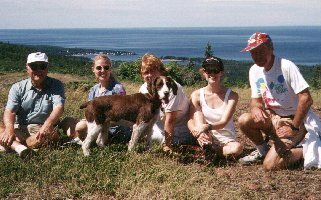 An unofficial source of Eagle Harbor, Michigan news, views and information. How About Some Ice For A Drink? It was fun to take my little wagon over to see Jake Martin at the old gas station on the corner and ask him to get me a block of ice from the ice house located on the side of the hill just east of the store. The location was selected so they could move the ice from the sleds in the winter to the upper story of the building and let gravity take it down to the lower level to be stacked and layered. The ice could then be removed from the lower level in the summer. Depending on the time of year, we might have to climb a ladder to get up to the active ice level and shovel off lots of moist saw dust to expose the blocks of ice. Jake would use a long handled sharp chisel-like tool to break off the size desired. I believe we used about a 30 or 40 pound block in our small wooden ice box. This of course, before we had electricity in the Harbor. Sometimes, to save the cost of a cake of ice, and to add a little adventure to the process, Dad (Herb Kellow) would decide the we should take the old 28 Olds up to the ice mine to get our necessary refrigeration. (It wasn't really called that in those days, it was just plain ice). The ice mine was located off the Garden City road and the trail into the mine was about 200 yards beyond the open field where the apple trees sit along the road. Once on the trail, going in a north easterly direction, you would look for a rather large thornapple tree. Then turn right and up to the mine. The Pats really loved that thornapple tree. We would generally find ice in the mine until July and that was because the mine entrance slanted to the south for a short distance then made an abrupt turn to the north and went down. The ice would be just around the bend. Naturally we didn't get nice square blocks like those from the ice house, but we would chip away what we needed using a small hatchet and occasionally get some nice chunks for our trek back to the Harbor. We generally had a multiple purpose for our trip, as we would scout the birds and deer to see if there might be some merit in hunting that area in the Fall.